Perhaps the most exciting technology to hit the construction industry is the application of infrared radiation thermography. For many years, there have been multiple uses of this technique in other industries, especially medical, security, and military applications. However in the construction industry, it is chiefly used for detection of water leaks, moisture penetrations, mold detection, heat and energy losses, and structural integrity inspections. IR thermography uses specialized cameras, much like camcorders, that are capable of capturing infrared radiation emitted by objects referred to as its "thermal condition." The most sophisticated cameras can actually measure up to 78,000 individual temperature points of any object, in addition to producing live digital imaging. The resulting images indicate the amount of heat energy emanating from targeted objects and their surroundings. Often referred to as a thermogram or a thermograph, trained professionals can identify areas of concern through the colored patterns of the infrared radiation and are able to analyze the source of heat and energy losses of the objects and surrounding areas. IR thermography can be especially helpful in determining whether concrete cracks are of an immediate concern or simply cosmetic. 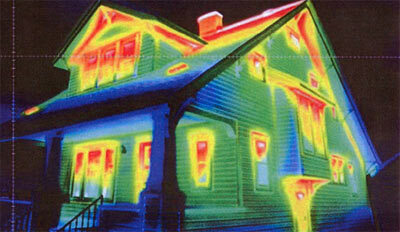 Infared Thermography can be used on local areas or on your entire home to detect all sorts of problems. IR is part of the electromagnetic spectrum perceived as heat. Because every object above freezing emits heat, this energy can be picked up by specialized thermal cameras. The wavelengths of infrared energy are not visible to the human eye because they are too long to be detected. The higher the temperature of an object, the greater the IR radiation emitted. Professionals trained in analyzing the images from thermal imaging cameras can provide valuable information regarding moisture assessments, remediation oversights, energy audits, roof and electrical system inspections, and water damage investigations. These inspectors are able to target temperature differences caused by evaporation, radiation, thermal bridging, infiltration/exfiltration, and other sources. Suspect areas can be identified much more quickly and accurately than with the naked eye. IR thermography inspections can ensure the proper workmanship during construction and identify faulty materials before it is a costly inconvenience to repair and replace. Scheduling a few inspections during the construction process is ideal for making certain that the foundation is laid properly and can ensure the overall quality of homes whether using traditional construction or insulated concrete forms. Electronic, data-logging moisture detection equipment can later verify problem areas or core samples can be obtained from roofs or walls. This verification gives additional assurance that the results from the IR camera are reliable. All property owners and their insurers faced with an alleged claim can find these tools essential to the decision process and proper maintenance of the structure. It is also advisable to have an IR thermography inspection performed as a preliminary to considering a basement remodel project. Before investing the time and money to seek out the high quality materials, it is best to ensure that water leaks and mold infestations will not become a problem in the future. It would be a shame to have the basement finished and have your flooring and possessions later destroyed because you were not aware of a concern that could have been easily detected. Infared Thermography inspections can detect hidden water damage and mold growth. IR thermography is especially ideal in detecting mold and remediating concerns. Because mold prospers and proliferates in damp and extreme temperatures, mold infestations can become widespread and cost thousands of dollars very quickly. These areas are typically hidden from plain view and inspection is made much more difficult and expensive when dealing with structural tear-downs of crawl spaces, foundations, basement walls, window sills, behind walls, insulation, roofs, attics, etcetera. These areas are particularly prone to the moisture infiltration, leakage, and temperature extremes that are ideal for continued concerns. Typically, inspectors can offer the following services found below. Home efficiency inspections offer several advantages to homeowners and contractors during and immediately following the construction process. Hard copy documentation of the inspected conditions can be used to verify the workmanship or material quality, ensuring the building contractors honor their agreements and warranties. Any areas of concern are clearly identified allowing the contractor to efficiently make any repairs, replacement, or adjustments. Many items in construction require hard copy documentation of the conditions inspected. Energy-related problems caused by poor design, workmanship, or material failure can be corrected prior to the end of the construction process saving both the homeowner and contractors in time and money. Below is a listing of the most important applications for a home efficiency inspection. Document and record location of studs and insulation for future reference. Reduce heating and cooling energy losses. Detect poor electrical connections, overloaded circuits and other electrical imbalances. Locate missing, improperly installed, wet or damaged insulation in walls, floors, and ceilings. 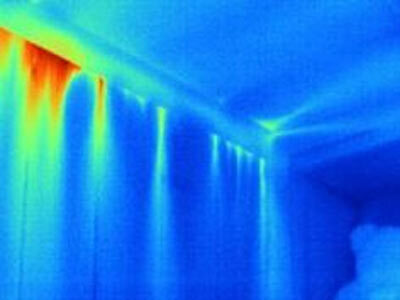 Infared Thermography identifies mold behind a wall that is not detected by visual inspection. Wet or defective insulation within the roof, wall, crawl space, or foundation structure can be detected quickly and accurately. Defective insulation not only can lead to mold concerns, but also creates a favorable environment for pest infestations. An inspection allows the defective areas to be repaired at the earliest opportunity, minimizing costs by only replacing and repairing what is needed instead of the entire area. Other advantages to identifying specific structural components are listed below. Eliminate Replacement of Structurally-Sound Materials. IR thermography is ideal for identifying electrical concerns. It can encompass hundreds of connections very quickly. The heat from electrical imbalances is very easily picked up on the infrared imaging. Poor connections, short circuits, overloads, and other imbalances can be isolated and quickly repaired. This is particularly useful during initial construction and remodeling projects. Ensuring that the electrical system is working correctly will increase the comfort appeal of basement living space and encourage regular use because safety and everyday lighting can be maximized. Locate Problems Without Interrupting Service. The ability to identify potential structural component weaknesses and concerns prior to extensive damage is very cost-effective for property owners. Homeowners and business owners all enjoy being able to save costs and time in attending to major repairs. The documentation available on most thermal imaging cameras allows for progress reports and monitoring of issues not needing immediate attention. Using IR thermography technology to detect moisture, water leaks, and other structural integrity deficiencies is very cost-effective for property owners. Most problems leading to structural integrity deficiencies are impossible to detect with the naked eye. It is not until the underlying cause has caused significant damage that the moisture problems and mold infestations can be detected. This is especially helpful in determining whether a foundation is shifting or sinking. Repairs made at the earliest stages will ensure great savings if the concern goes undetected. IR thermography inspections save significant repair and replacement costs. Detecting structural concerns early often prevents more complicated and costly work and components. Traditional inspection methods often require removal and expensive tear down of structural components in order to uncover hidden foundation concerns. Determining the source of the concern can lead to the proper repair method, and is particularly useful in deciding the proper method for soil concerns. Because infrared imaging penetrates through walls, thousands of dollars in teardown and remediation costs can be saved by an instantaneous diagnostic assessment performed with no destruction of property. Regularly scheduled IR thermography inspections allow repair and replacement of structural components on a basis of preventive maintenance. Think of all the material costs that can be prevented by detecting problems when only a few structural pieces need attention! An infrared inspection process can be beneficial in situations where the property owner suspects water damage, mold infestations, energy leakage, or other structural integrity issues. 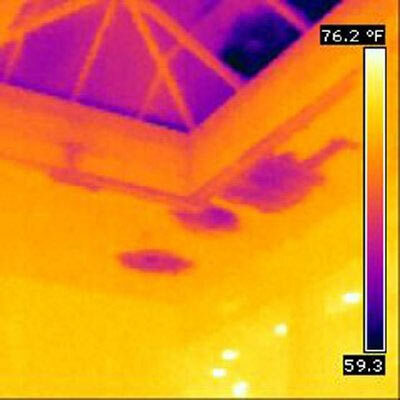 Many insurance matters can be quickly determined due to infrared inspections. This saves the property owner valuable downtime. Leak detection needed for roof, ceiling, windows, plumbing, water heater, foundation, doors/entryways, etcetera. Basement appears wet, has a musty odor, or has previously flooded. Observable signs of mold need to be tested for toxicity. Water intrusion has caused structural damage and an origin and cause assessment will determine if the claim is the result of a covered issue. When seeking a professional to perform an IR thermography assessment there are several limitations to keep in mind. The results of an analysis are not the solution. It is the beginning of the investigation to assist the property owner/developer to prevent a problem from worsening or detect it before it becomes serious and expensive. An infrared camera image without accurate temperature measurements or a competent interpretation will determine very little about the condition of a structure or its susceptibility to mold growth. The image without proper interpretation of measurements can be extremely misleading and may suggest a problem that does not exist. It is more important to concentrate on finding professionals that are properly trained and have a reliable track record, than concentrating on the type of cameras utilized. The analytical skills of the professional override the sophistication of the chosen cameras and equipment. Training and staying proficient in IR scanning is very time consuming. The fact that most cameras have a 2% marginal error makes it imperative to hire an inspector that has a solid performance reputation. The most popular types of cameras that store images use a FLIR system. Besides providing documented hard copy images, many of these cameras can store the images on a PC system and provide video imaging. In the past, the most sophisticated models often required cryogenic cooling by a specialized miniature refrigerator or liquid nitrogen. The newer technologies are concentrating on using lower cost uncooled microbolometers. Their resolution is often lower than optical cameras, but there are other advantages and portability issues that make them a more practical choice. With all the advantages of IR thermography, it can be worth the effort to utilize a professional well-versed in this technology. Your home is an investment and this technology can save costs by detecting concerns while they are still small. Tip #28. How can drainage system leaks be minimized during the construction process? Soil composition analysis, proper alignment of the concrete slab and foundation wall are the best prevention methods. Placement of water vapor barriers and proper waterproofing will also lead to prevention of strain on drain tile systems. Proper grading, selection of drainage systems, and compatible sump pump will also lead to positive outcomes.